OFF-ROAD LIVE ! : LIVE! VEGAS TO RENO 2015 OFF-ROAD LIVE! 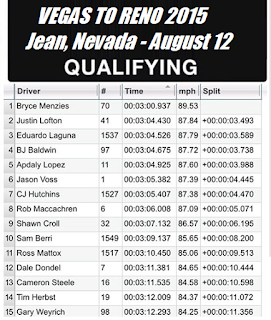 Jason Voss WINS VEGAS TO RENO 2015! 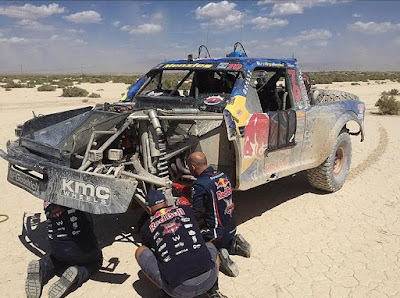 In typical August Nevada weather in the vast western Great Basin Desert, the 2015 Vegas To Reno desert off-road event went off Friday and Saturday, August 14th and 15th, with so many technological snafus, many racers were left wanting for recovery. The tracking company hired for this event, claimed three units were "new" and used in a test. The Parkhouse team (1 Unit) and Banning team (2 Units) had the 'testing' tracking units. It is claimed by the tracking company, that these were "pass alert" enabled tracker that are ready for larger production and distribution. It is also claimed, that all of the new units will be certified by Iridium. This is an important point because "Volocore", a competitor of BITD's tracking, claims it is using Iridium tecnology in its 'new' tracking units. Volocore was also testing at this event. We'll call Volocore, but don't count on them giving the public the story. Numerous racers left the start line without tracking units. Casey Folks does not mandate trackers for quads and motorcycles in this event. Five units failed to work properly. 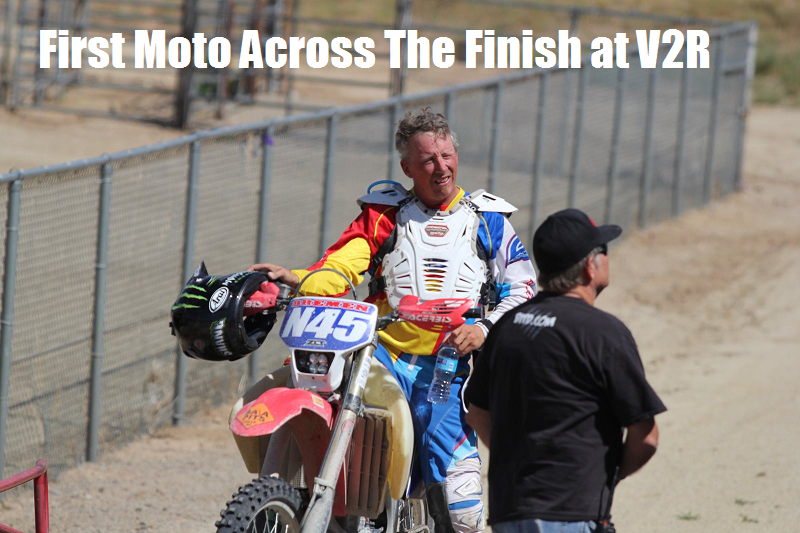 Jason Voss caught up with a broken down Bryce Menzies and BJ Baldwin was in the physical lead going into pit 5, Baldwin's flat tire let Voss to fly to victory late in the day at the finish line in Dayton, Nevada. 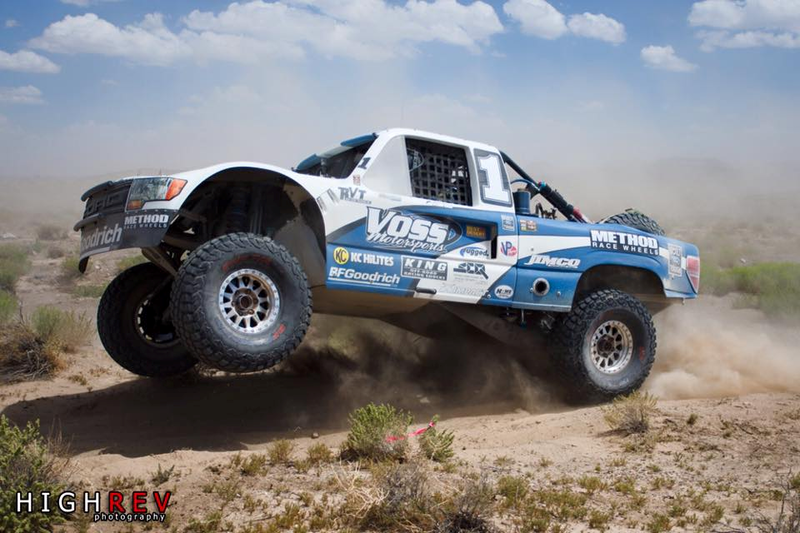 Jason Voss refuels just east of Goldfield Nevada, on his way to victory in the Vegas to Reno Desert Race. THE BIG STORY CLICK HERE! 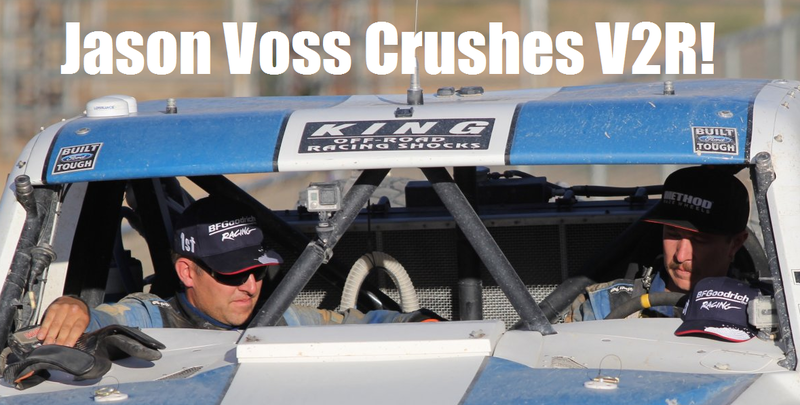 *Jason Voss Wins Vegas To Reno 2015! *4:50PM Jeff Hancock, First Quad Finishes Q9 (16:49:10) won by 8:10 over the next quad competitor. *4:45PM Race Leader #1 Jason Voss Out Of Pit 12, Far ahead of the rest of the field. Schooling the bunch! *First Bike has Finished! N45 Francisco Arredondo (15:07:29) "got in by three minutes" over the next competitor (N2). *Jason Voss first through Pit 9, first through Race Mile 300; 4 hours 59 minutes. *12:55PM BJ Baldwin into Pit 5 on a flat. Bryce pitting, Voss in front of BJ Baldwin, So, 1) Jason Voss, 2) BJ Baldwin, 3) Bryce Menzies, 4) Rob Mac, 5) Lalo Laguna. Leaders nearing RM 203. *"Absolute DogFight! between BJ Baldwin, Jason Voss and Bryce Menzies at 12:29PM going past Goldfield Nevada!". OFF-ROAD LIVE! Race Reporter Sarah Caldwell. At RM 153...11:55AM 1) Menzies 55mph, Close behind...2) Voss 90 mph! *!TOP Leaders Through Pit 3! 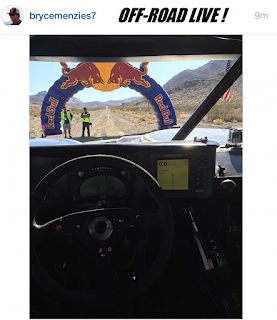 1)Bryce Menzies at RM 109, 2)Jason Voss at RM 108 3)Eduardo Laguna [#1537] at RM 108 4)Apdaly Lopez [#11] at RM 106 5)Justin Lofton [#41] at RM 105 6)Rob Mac [#6] at RM 103. *From Pit 8, Bikes, N1 & N45 Right Next To Each Other! RACE UPDATE! Steve Myers now says, "we are testing 3 (three) new units". IRC refused to say which teams have the "new" units. The pre-race story. BITD race tracking services are provided by IRC/International Racing Consultants. OFF-ROAD LIVE! quoted IRC regarding Vegas To Reno tracking. They stated at the time, "we are testing ten (10) New Pass Alert tracking units in the next BITD race event." 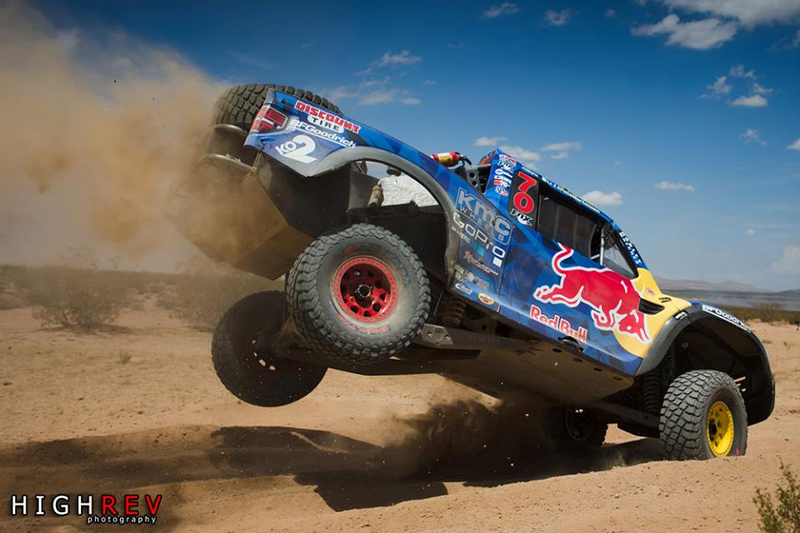 Now, the Vegas To Reno 2015, will become known as the MINT 400 race disaster recovery event! Weeks before the race, a source at BITD confirmed the '10 units' figure. But, when OFF-ROAD LIVE! asked IRC, Steve Myers said, "we're testing 40 units at Vegas To Reno". **BREAKING NEWS! CLICK HERE NOW! 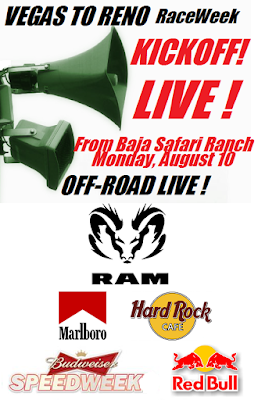 RACEWEEK KICK-OFF FROM Baja Safari Ranch! CLICK HERE TO LISTEN-IN TO THE KICK-OFF! MONSTER Mike's GARAGE LIVE! TOYOTA Carlsbad HERE! CLICK HERE FOR THE SHOW! HERE! *MONSTER Mikes GARAGE, 5PM LIVE! 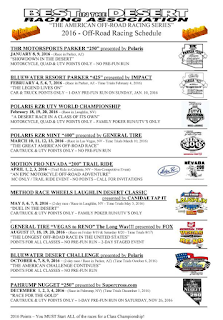 Two days remaining before the green flag drops on Best In The Desert’s “Vegas to Reno”, 333 race teams have signed up so far for the “Longest Off-Road Race in the United States”. The impressive list of entries includes 39 Trick Trucks, 24 Open Class 1500 Cars, 50 UTVs, 39 Ironmen Motorcycles and Quads, and 24 Class 6100 Spec-Engine Trick Trucks. Have things changed at Best In The Desert! Just a short time ago, BITD, the racing association, had no website and considered information access in terms of the middle ages! That's why OFF-ROAD LIVE! started providing services. There was no access to race maps, public viewing areas, nothing! Not even the paid contestants themselves received needed information or documents. Only from embarrassment, did Casey Folks change the situation. Just recently, did the BITD website step up to the twenty first century. Modern access to the most basic racing information for the paid racers. The viewing public is still on the outs with racers and racing association leaders. Why? They consider the public, a nuisance. As an example of how little thought there is given to the 'General Public', there are NO DESIGNATED VIEWING AREAS in this event! The longest desert off-road race in America. Please report public incidents to our desert off-road racing field reporter at 619-251-6005. Call '911' for immediate assistance. Even while racers kill themselves during events, many racers have run-over and killed bystanders. Google "California 200". This year is the 5 year mark since many bystanders were seriously hurt and killed by an out of control, 'desert off-road racer'. The desert off-road racing community, participated in an attempted cover-up of many of the facts relating to the case. To this day, the 'guilty' racer, uses fake names to continue his "racing" activities. Journalism vs. Cotton Candy? Which do you prefer? 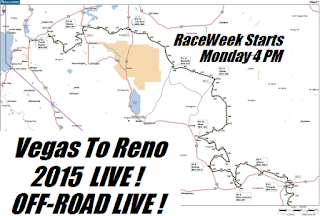 The Vegas To Reno 2015 Storyline, "Record Entries" & "Exclusive LIVE! Coverage"
OFF-ROAD LIVE! 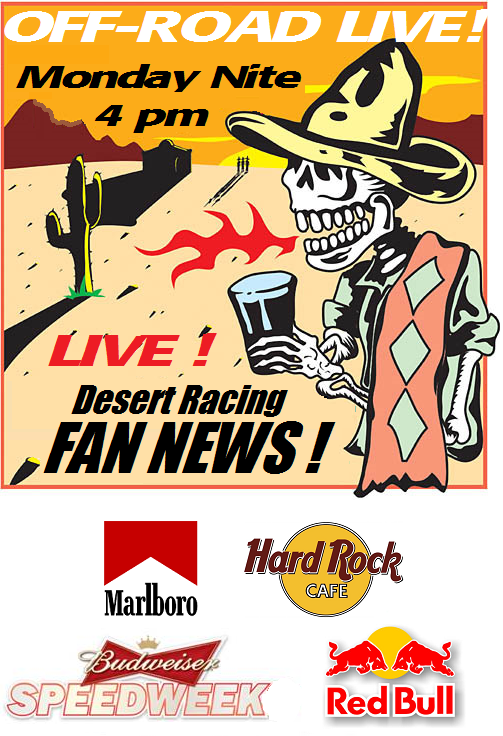 continues its historic live coverage of American desert Off-Road Racing! Casey Folks, director of Best In The Desert – "the world’s largest desert off-road racing organization", announced today he set a new record for entries for 2015’s “Vegas to Reno” desert off-road race event, the Longest Off-Road Race in the United States, when 330 cars, trucks, UTVs, ATVs and motorcycles signed up in time for the drawing. Now with just days before the race, there will be 39 Trick Trucks and 24 Unlimited 1500….and they’re still taking entries so the number will go even higher. 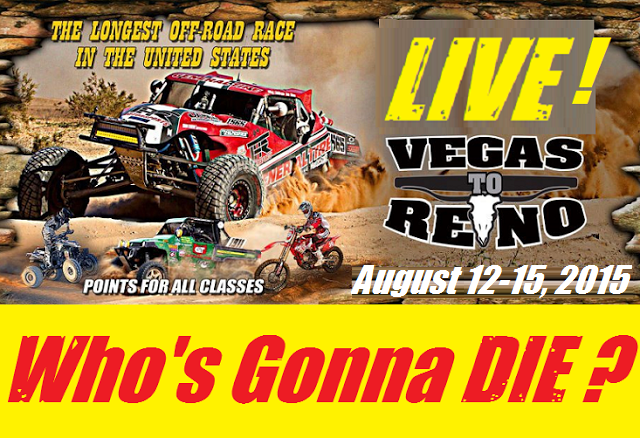 The 19TH “Vegas to Reno”, runs August 9-15, 2015, and is the last of the United States Off-Road events covered online live, for the year. Teams will be gathering in Las Vegas as they prepare to match their skills against some of the most unforgiving terrain Nevada has to offer. 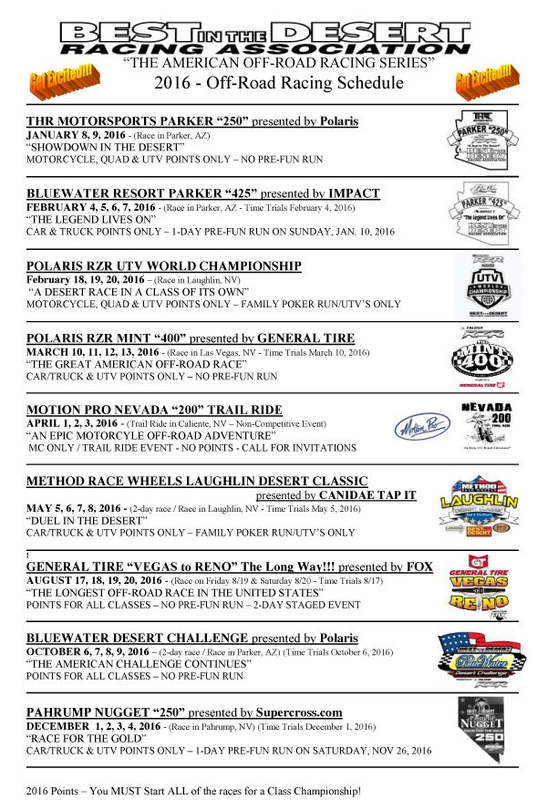 This year’s event celebrates 19 years for the 'Best In The Desert' racing association promoting an off-road desert race over 500-miles long from Southern Nevada to Northern Nevada. It will feature an extremely challenging 545-mile point-to-point course. RaceWeek explodes on Monday, August 10 with OFF-ROAD LIVE! from the Baja Safari Ranch. Tune In! Vegas To Reno RaceWeek continues Wednesday, August 12, for the Trick Trucks and Class 1500 Unlimited Cars when they qualify for their starting positions at the Time Trails and compete for the $1000 “Team Ford Pole Award”. Not relying simply on “the luck of the draw” for the starting order, Best In The Desert allows the two fastest classes to compete head-to-head for their chance to be first off the line and the best shot at the coveted overall finishing spot. MONSTER Mikes GARAGE is LIVE! From TOYOTA Carlsbad at 5PM Wednesday, August 12 in one of the BIGGEST BADDEST Events of the Year! OFF-ROAD LIVE! Race festivities continue in North Las Vegas, Nevada on Thursday, August 13, at the Aliante Casino & Hotel. There, race fans will see the most unbelievable collection of high-tech cars, trucks, motorcycles, quads and UTVs that are specially built for racing today as they parade through contingency and tech inspection. *The 2015 “Vegas to Reno” will start early Friday morning, August 14th near Beatty, Nevada, about 100 miles north of Las Vegas. LIVE! ONLINE coverage will begin sharp at local nautical twilight, (BMNT) 5AM, Mountain Time. Sunrise this day is 6AM, during 'Dark Moon'. First off the line will be the Motorcycle classes followed by the Quads. After a substantial delay for safety reasons, the Car, Truck and UTV classes will head out on their quest to reach the finish line and hopefully a victory. The race finishes south of Reno, Nevada in the town of Dayton. Due to the extreme distance of the race-course, a 24-hour time limit has been set, so racers will still be coming across the finish line well into Saturday morning. UPDATE! OFF-ROAD LIVE! Casey Folks Interview Today Wednesday, July 29. LIVE! From Las Vegas, Nevada!